Saturday on the Dakar Rally marks the well-earned rest day for competitors at the 2019 Dakar Rally. In what has been a unique Dakar so far, times between all of the top riders have been close on the fast and unpredictable stages. With each stage throwing up a number of surprises it hasn’t all been endless dunes as some may have expected. Tricky navigation and a varied mixture of terrain have challenged the riders and with the rally soon to be retracing its route back towards the finish in Lima, conditions will be even tougher for the final five days of racing. Sam Sunderland’s stage win on Friday elevated him to second overall, just less than one minute from the lead. Feeling fit and confident, the 2017 Dakar winner is ready to push during the second half of the rally. The 2019 Dakar Rally has been a tough one for Toby Price. Despite nursing a wrist injury sustained just weeks before the start, the determined Aussie has gritted his teeth and ridden through the pain to place fourth overall at the rally’s halfway point. Enjoying a successful rally so far, Matthias Walkner currently lies in seventh overall with a stage win under his belt. A hard landing from a drop-off on stage four couldn’t even slow his pace. The defending champion is happy with his performance so far and keen to attack the second week of racing. 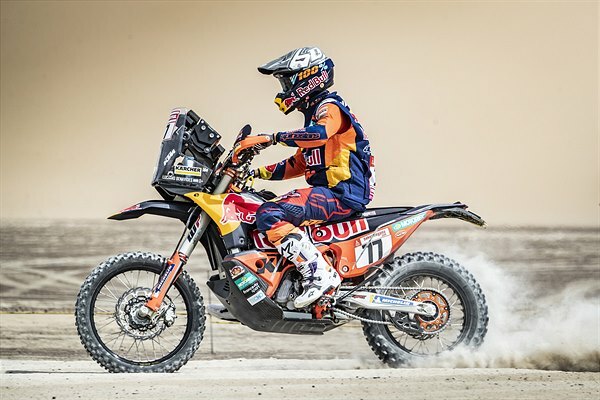 Riding only his second Dakar and his first in the Red Bull KTM Factory Racing team, Luciano Benavides continues to improve as the race progresses. Finishing a career-best of seventh on the gruelling stage five, the Argentinian feels fit and confident ahead of the next half of the event. The KTM Factory Racing pairing of Laia Sanz and Mario Patrao have put in strong performances on the first five stages and are both looking to better their positions during the latter half of the race. Despite recovering from illness coming into the rally, Sanz has ridden extremely well to lie in 20th position. Patrao enters the Dakar’s second week lying 29th. Following their rest day, riders head out to the bivouac on Saturday evening to prepare for Sunday’s stage six. The route covers a total of 838 kilometres, with a 336-kilometre timed special. Competitors will arrive back at the bivouac in San Juan de Marcona after racing some of the same ground covered already – good navigation will be necessary in claiming a top result.